Why Are More Men Suffering From Low T Than Ever Before? Guys, here's the deal - our testosterone levels are dropping faster than ever before! Sure, we naturally lose around 1%-1.25% of our testosterone year over year with age, but it looks like today's modern life is really taking a toll on our manhood. There are new environmental and lifestyle factors now that are really doing damage to men's T levels. 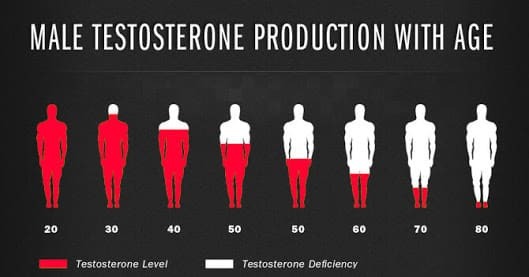 As you age, your testosterone levels with naturally decline over the years, with the greatest overall drop occurring between the ages of 30 and 50. We know there is a natural decline of T that comes as men age, but what the medical community is seeing now is that the rate of decline is faster now, and that younger and younger men are dealing with various issues related to lower levels of testosterone. Instead of men coming in from ages 35-45 with less-than-optimal testosterone levels (or “low T”) they’re coming in their late 20s!" (Reuters Health) - A new study has found a "substantial" drop in U.S. men's testosterone levels since the 1980s, but the reasons for the decline remain unclear. This trend also does not appear to be related to age. Why Are Testosterone Levels Lower Now? There isn't one specific medical study that we can't point to in order to answer this question. Men today are not eating as healthy as they used to. The food industry has continued to evolve and become much more sophisticated with marketing and advertising to the point where even "healthy" packaged foods are loaded with testosterone-killing additives and preservatives. Then there's just the sheer amount of junk food and fast food that is more available at a cheaper price than ever before. Foods high in simple carbohydrates, trans fats, hydrogenated oils, soy, and a bunch of other things that we can't even spell or pronounce either directly produce more estrogen which kills testosterone, or they lead to significant weight gain and obesity, which also kills testosterone. Men are less physically active than they were in generations past. Men used to be outside more hunting, fishing, building things, farming, hiking, camping, etc. With the emergence of satellite TV, the Internet, YouTube, Amazon Video, NetFlix, Hulu, video games, computers, and social media, today's modern day man has no incentive to ever get off the couch or out of his chair to go outside and do something physical. This includes working out. With so many things making it so inviting to stay inside, men are having a harder time disciplining themselves to go work out to at get some physical exercise and activity. Along with this men seem to be more chronically stressed out than previous generations when life was simpler. They got better quality sleep because they did more physical things and got physical exercise. They're day-to-day recoup time was of better quality and more defined than today's man. Here's what we know - we know that there are multiple different factors that are contributing to the faster rate of testosterone decline, therefore, it stands to reason that to defend against the problem, it's going to require a multi-faceted defense. We have a number of proven ways to combat the problem that fall into the category of either Diet, Lifestyle, or Environmental. We'll talk about some of the most powerful ways that are getting men the most measurable and sustainable results. The first strategy we'd like to address is in the diet category, and it has to do with supplementing with a testosterone booster. A test booster just makes sense as an easy first-line-of-defense strategy. Why? Because it requires the least amount of work, and it is specifically created to address the issue.